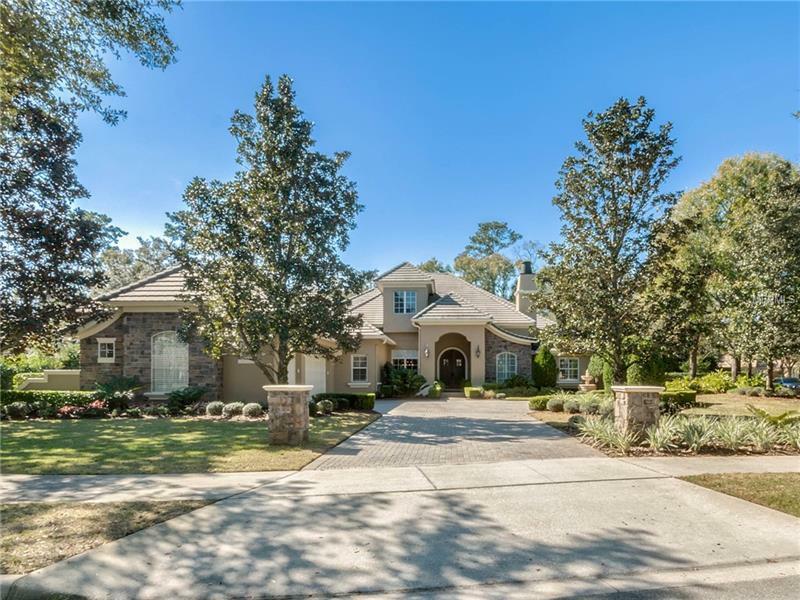 Stunning custom one-story home built by Richard Woodruff in guard gated Alaqua Lakes Seminole County's top guard gated golf course community. This perfectly maintained home features nearly 5000 square feet with five bedrooms plus a bonus room and office/den. Situated on private fenced 3/4 acre lot backing to conservation anyone seeking a private oasis will love this special spot. The backyard features a saltwater pool and spa resurfaced in 2017 with a Pebble Tec finish showcasing tranquil spillways and gas fire bowl as well as an expansive covered lania with a complete summer kitchen tongue and groove ceiling and pavers. Inside you will find travertine and hardwood flooring high ceilings a grand foyer stunning living room with a fireplace and generous windows looking onto the backyard and pool area. Other interior highlights include plenty of built-ins an oversized kitchen with built-in appliances including gas cooktop two dishwashers exotic granite counters a hidden pantry plus a built-in desk area and butler's pantry. The master suite is its own private sanctuary with a large closet private office/sitting room and luxurious master bathroom. Alaqua Lakes offers wonderful amenities including a 7-acre community park with pavilion playground and sport courts a resort-style community pool 5 Har-Tru clay tennis courts and a 24-hour guarded and secure community entry. Call today to schedule your own private tour of this very special designer home. Once you visit you will not want to leave! Pet Restrictions: Per Seminole County ordinances and Alaqua Lakes HOA. Buyer to verify.